How is blood flow measured in a vessel? The total volume of blood that passes a certain point in the vascular tree within a given period of time is known as the bulk flow and is expressed in units of cm³/sec. The average blood velocity (V) equals the bulk flow (Q) divided by the cross-sectional area (A) of the vessel: V = Q/A. If A is measured in cm² then the velocity has units of cm/sec. At different points within the lumen of a vessel, however, instantaneous blood velocities vary considerably. Near the vessel wall where fluidic shearing and frictional forces are greatest, the blood flow will be nearly zero. 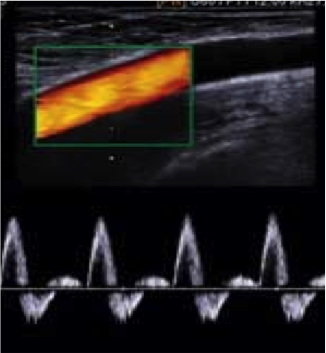 Centrally within the lumen, blood flow will be most rapid; peak velocity often exceeds the average velocity by 50%. Instantaneous blood flow at a given point in a vessel will also depend upon the phase of the cardiac cycle in which it is measured. In the proximal aorta and other central vessels, the direction of blood flow will even reverse between systole and diastole. The units of blood flow can sometimes be confusing and depend on the context and application. As defined above, bulk blood flow (Q) is measured in units of volume/time, so typical reported values might be cm³/sec or mL/min. In perfusion MRI studies, "normalized" blood flow is often reported, measured in units of volume/time/mass of tissue. 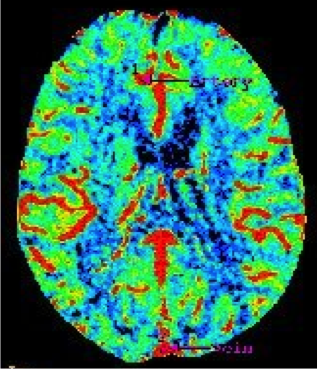 Thus cerebral blood flow in the image above left might be given in units of mL/min/100g or similar units. The velocity and pattern of flow depends on the location of the artery, the compliance of the vessel wall and whether or not the artery feeds into a high- or low-resistance vascular network. As described above, the thoracic aorta has prominent reversal of flow during diastole as the coronary circulation is filled. The brain and kidneys have low vascular resistance; thus, carotid and renal arterial vessels demonstrate high forward flows even during diastole. Conversely, arterial beds fed by muscular arteries have high terminal resistance. Arteries supplying the extremities typically have a tri-phasic flow pattern consisting of 1) rapid forward flow reaching a peak during systole; 2) transient retrograde flow during early diastole; and 3) slow antegrade flow during late diastole. All of these patterns may change if a vessel is stenotic or loses compliance due to atherosclerosis. Veins do not pulsate with the cardiac cycle, but do vary with respiration and changes in intrathoracic pressure. OpenStax College. College Physics: Flow rate and its relation to velocity. Rice University, 2014. What are the usual velocities of blood found in the human vascular system?